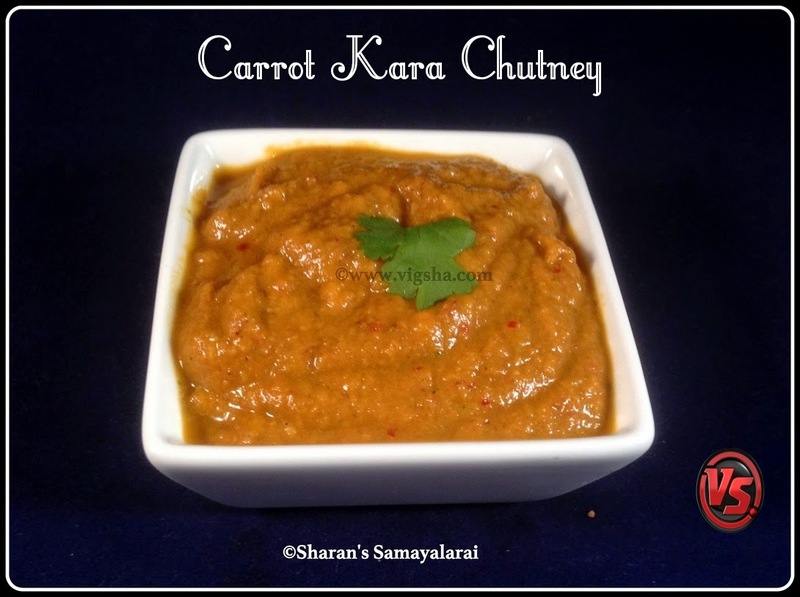 Carrot Spicy Chutney is a healthy chutney that goes well with Idli and Dosa varieties. I have already posted a simpler version of this chutney, do check out the recipe here - Simple Carrot Chuntey. Also check out more carrot recipes which I have already posted - Carrot Poori, Carrot stuffed Paniyaram, Carrot Cabbage Poriyal, Carrot Rice, Carrot Raita, Carrot Payasam. 1). Heat oil in a pan, add cumin, urad dal and saute till it turns golden brown. Then add red chillies and chopped onions, saute till onions turns translucent. 2). Add chopped carrot and saute till they become soft. Then add coriander powder and turmeric powder. Saute for a minute and switch off. 3). Let the sauteed contents cool completely. Transfer to mixie jar and add coriander leaves and grated coconut. Grind it with little water to a fine paste. Done ! Serve with Dosa or Idli varieties. I served it with Sago Dosa.